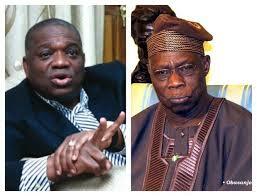 ASHIWAJU MEDIA: Former Abia Governor Orji Kalu Fires At Obasanjo, Says You Are Corrupt Sir! While accusing the former President of owning a foreign account and a platinum credit card, Orji Uzor Kalu added: “The most pressing question I wish to put to you, sir, revolves around your long tenure as Nigeria’s Minister of Petroleum Resources since 1999. Why has there not been a properly audited account of the Ministry of Petroleum resources since then, despite outcry by the people for this to be done? “I have repeatedly made the observation that corruption is rife among senior officials of government, especially those at the federal level, and among your friends, your business associates and cronies. Around you and in your name have coalesced a few powerful brokers of corrupt practices who peddle your influence and extract billions of naira in the form of oil and gas and defence contract commissions. “The budget is manipulated at the National Assembly with the active connivance of your surrogates and a few Senators, thereby carting away billions of naira through contract padding or inflation. The felonious activities of this cabal, including the foreign accounts of some of your aides and serving and former ministers are well known to the international community. I would be surprised if you feign ignorance of this unfortunate situation,” Kalu wrote. Kalu went ahead in the six-page letter to accuse Obasanjo on specific corrupt practices saying: “A few examples are necessary to buttress my case: The Abuja National Stadium, why was the original design for the stadium, which had a five star hotel and which contract was won by a Chinese firm discarded and re-awarded to another foreign construction company based in Nigeria without the component of a five star hotel but at five times the price originally quoted by the Chinese firm? There is unquestionable evidence at my disposal pointing to the fact that mega corruption lies at the base of this dramatic turnabout.